Sometimes we acquire new laptop or a new keyboard and later find out that some of the keys on the board are not functioning well. This can be a major turn down, knowing that with a single key not functioning we can end up buying another keyboard because it is almost impossible to repair a Key. To save you for all those setback we came up with this article discussing some of the best software you can use to diagnose or test whether the whole keyboards is working as it should. Some of these testing software can also be used as typing tutor and also they can help you measure your typing speed. With consuming much time dwelling on that lets jump to the list. PassMark Keyboard Test is one of the best keyboard testing software available on the internet today. The software allows users to check whether all the keys are functioning properly. Other than just checking the keys, PassMark Keyboard testing can also be used to check whether all the keyboard’s LED are working properly, ability to check on the scans codes that are generated by the keyboard and also measure ones typing speed. Each stroke made on the key board is registered and represented on a graphical image of the key board. After making each stroke, there is a variety on information updated and displayed on window with the Key board image. 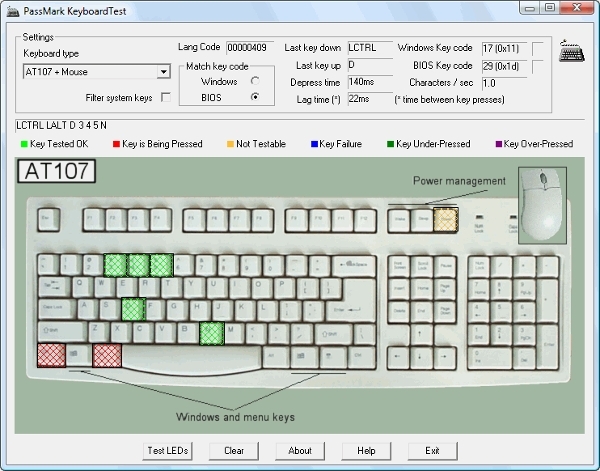 PassMark Keyboard Test software is mostly used in testing whether the keyboard is faulty, used in production line environment and also the software can be used as a typing tutor. This is another awesome keyboard diagnosing tool. Kb tester helps its users to know how many keys can be down at the same time and how many keys are not functioning properly. The software is free and has easy to use interface which makes it possible for anyone to navigate through it with little or no hassle. The soft is built for windows operating system for both 64 and 32 bit systems. While acquiring a new computer or a new keyboard this is one of the best software you should carry with you. It is a light weight and easy to install and start using. Last Tool on the list is the KeyboardTester. This Tool works just as the rest two mentioned above. Typing test is one of the best tools to train on typing it lets you know your typing speed and also checks whether all the keys are working right. The program is compatible with hundreds of keyboard models and also allows users to their specific keyboard layout. Despite having a user friendly interface. There are also hundreds of websites that can help check whether your keyboard is working right but on this post we only concentrated on the best Keyboard testing software. Hope the post was informative and beneficial to you.